I had spent what seemed liked many hours a day bicycling in my neighborhood as a child in the 1960’s, bicycled to babysitting job in the 1970’s, and I had made a 35 mile day round-trip from Haverhill to Salisbury Beach in 1982. Last week my old car failed inspection; but, I thought I only needed to get to the grocery store once or twice a week, to the post office occasionally, or to a bus to a train station occasionally, and I could use more exercise – walking or bicycling, and spring was almost here. I had to get to the post office, a half-mile away, which was going to close shortly. My two bicycles, a woman’s ten speed and a man’s five speed, and my former roommate’s bicycle were in my cellar. I lifted the ten speed out through the cellar bulkhead and attempted to inflate the tires. Alas, one old tire would not inflate; so, I used my former roommate’s bicycle that he left here. I had a successful trip, felt good, and decided my next trip would be to the grocery store five miles away from home. A few days later I was out of bananas and avocados, two of my favorite foods, and although I had recently received a shipment of eleven pounds of dates, I decided it was time to go to the grocery store. I lifted my ten speed bicycle with a child seat out of the cellar and inflated the tires. I was “carbed up”, dressed appropriately, gathered my mesh reusable grocery bags into my backpack, and set out to the Super Stop and Shop grocery store. The weather was warm, sunny, and clear and I noticed along the side of the road many dried wild spinach plants which had gone to seed before the winter killed them and some had even grown from cracks in the pavement which I always find amazing. There were a few small hills but only one large hill on the way. When I arrived at the grocery store I realized I had forgotten to bring my bicycle lock and having had my first ten speed bicycle that I bought with babysitting money stolen outside a store in Arlington in the early 1970’s, I decided to wheel it inside the store, leave it by the door, and shop as quick as possible. I quickly gently placed in my cart about ten bunches of bananas, a four pound bag of organic oranges, two pounds of tomatoes, seven Haas avocados, one pound of organic celery, nine ounces of organic baby spinach, seven ounces of organic baby romaine, and a package of three organic romaine hearts. My many bananas bunches received the usual curious smiles and giggles from the check-out girl and bag girl. She scanned my food and I gently placed it all back into my cart having decided to bag them by my bicycle because I didn’t know exactly how I was going to pack them onto the bike and my backpack. The guy who retrieves the grocery carts asked me to move my bike, so I brought first my cart and then my bike outside. I positioned one mesh bag in the child’s seat and put the oranges and avocados on the bottom which turned out to be a mistake because a few of the avocados got a bit squished. Oops! I gently piled most of the bananas on top until the bag was full, clamped the draw string shut, and tied it to the seat. 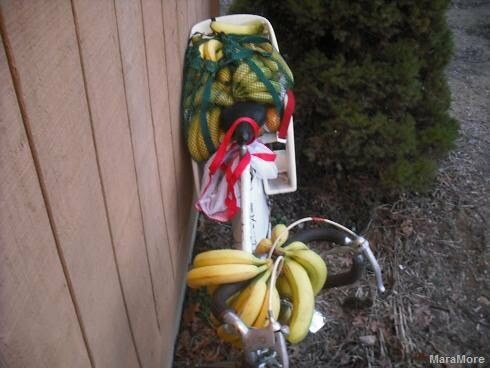 The remaining bananas I hung on the handle bar and bike frame. lol! I positioned another mesh bag behind the bike seat and put celery on one side and romaine and kale on the other and they went into the leg parts of the child seat. I put the tomatoes, romaine, and spinach in my back pack. My banana bicycle got a few curious glances from people. On my way out of the parking lot on a slight decline, I couldn’t stop and the bike veered in front of a truck stopped at the red light and tipped over on it’s side. I quickly righted the bike and pushed it out of the road way. I discovered that the brake had not worked because there was a banana behind the brake lever! Oops! Don’t try this at home, kids! I repositioned the bananas on the handlebars and was on my way. I navigated the hills with the help of some cool breathing exercises and felt my abdominal muscles working. My slightly rusty old bike was stuck in the easiest gear which was good for hills but slightly annoying on flatter ground forcing me to either peddle much quicker than I should have to or just peddle real slow both of which felt like I was not getting anywhere fast. lol. A cyclist flew past me and all my bananas. lol! I got a bit thirsty and stopped partway to eat an orange and enjoyed the scenery and fresh air. On my street within a quarter mile from my house one bunch of bananas hanging from the bicycle frame broke apart and fell to the ground. 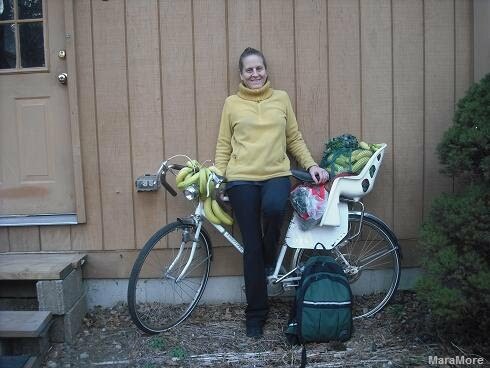 I stopped, backed up, balanced the bike with 30 pounds of produce cargo against my leg, and bent over and reached down to pick up the bananas. I had run over one of them with my tire. Oops! Poor banana! It was squished with a tire mark but the skin was not broken so I ate it soon after getting home.